What you guys prolly didn't know about me is that for the past year and a half i've dabbled in the art amateur astronomy. I got my first telescope around a 2 years ago, not an overly powerfull one, was good for looking at very local things, the Moon, Sun and Jupiter for example and was good for constellation and star viewing. A few weeks ago I purchased my second telescope, this one certainly means business and is a serious piece of kit, its well over 100% more powerful than my first one, its computerized, so finding things is much easier. 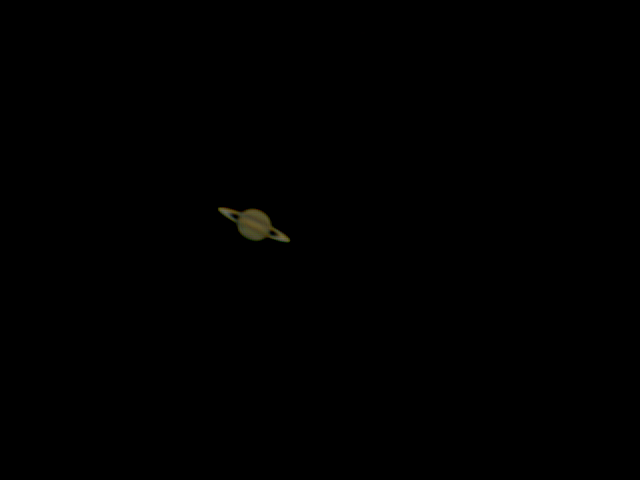 In the few good clear nights i've had, i've seen some wonderous things I could never see with my first scope, the main one being Saturn, in great detail. Now i've got to grips with my new kit, i'm starting to move onto my next goal in the worl of astronomy, and that is astro-photography. I had a clear night last night, and I started very nervously and slowly into this venture, on the photography site I have very basic yet fairly useful kit to start with, a webcam and a laptop. So with just a modified webcam (lens screwed out and fitted with a nozzle to fit into the telescope eyepiece), I took my first image (and only one) of our nearest neighbor, the Moon. What your looking at is the Mare Crisium (or Sea of Crisis), one of the many plains on the moon created by ancient volcanic eruptions. 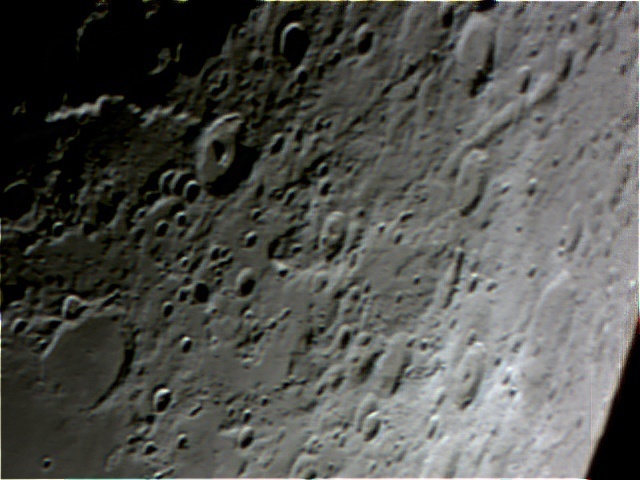 You can see a number of large impact craters to the south west (Pierce) and on the west side (Picard) of the mare. Yeh, its not great, its my first try, but with pretty much winging my way through the process, it isn't bad. The process isn't as easy as just taking one image, this picture is actually a composite of around 200 frames of video, it should be more, I was suppose to take a 30 second video, for some reason it only took 16. After processing the image and getting rid off the bad frames there wasn't much left. It was also pretty windy and the scope was wabbling constantly, so the software did ok to get a semi focused and stable picture. I'm going to have another go at it soon, clear sky's willing and will post what I get. Will share a few here for a while and will prolly start my own blog or something soon, or at least post my images on astronomy websites. 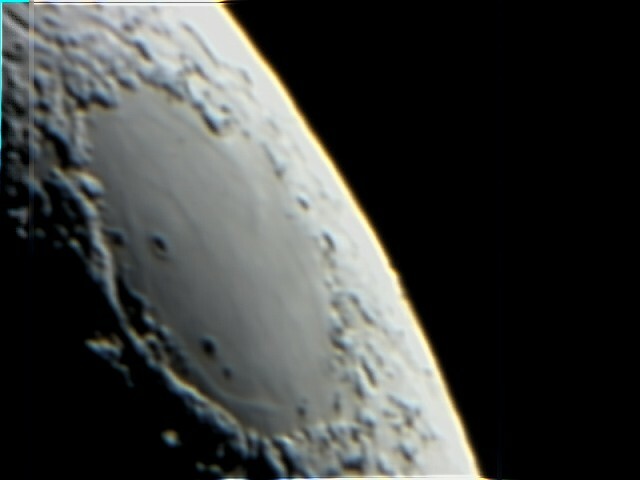 Taken on the 10th April this was my first EVER picture of a planet, taken pretty much the same way as the moon, this was about 1200 frams of video, stacked together to make one image. 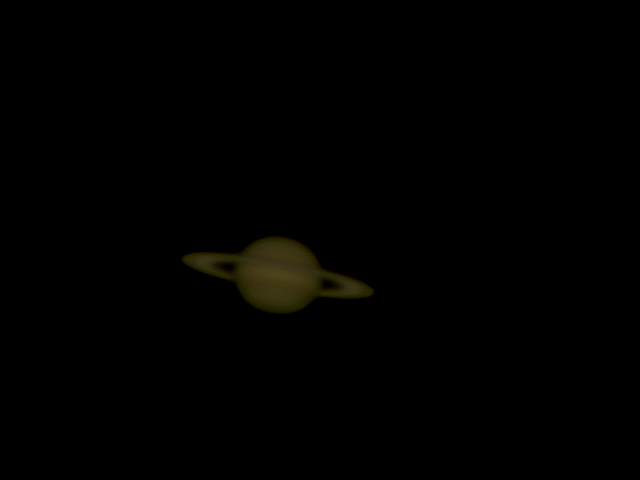 Very happy as a first try, you easly make out the storm bands on the planet and of course the rings of Saturn, look close near the point of each side of the ring you can see and fient curved black line, this is called the Cassini Division, if you can see that, you have a good pic. x2 manification lense + the camera. 12th of April, this was using just the camera with no extra magnification, and a lower exposure, which is why its not as bright, this is more what it looks like with your eye's through the telescope. 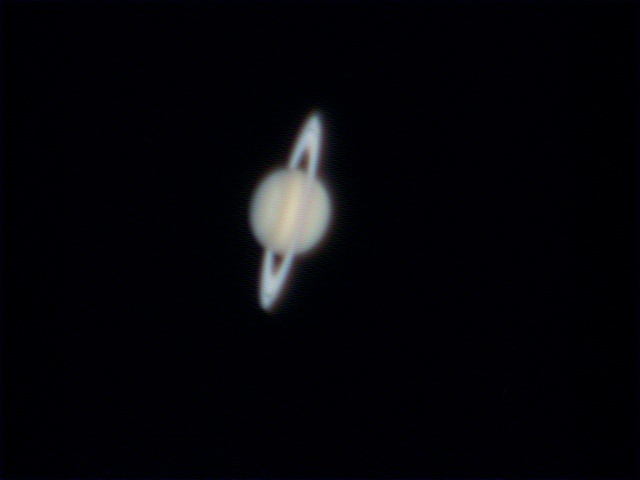 17th April, once again with x2 magnification + camera, and a lower exposure and my best picture to date, Cassini Division is more visible. And lasty a one more moon pic. 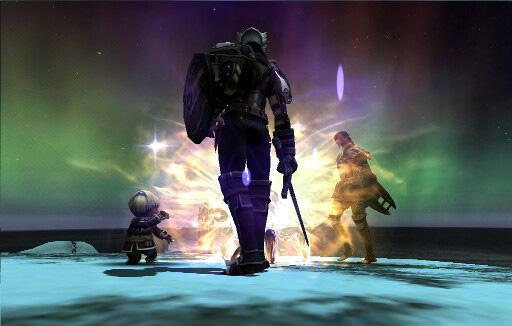 Pretty cool Manni, pretty cool. Jupiter, taken early hours of Monday morning. Pretty good picture considering the focus wasn't perfect, Jupiter and 3 of its moons clearly visible. Jupiter red storm belts clearly visible. Had some with double magnification but I couldn't get the focus quite right.